For as long as he can remember, high school student Ichigo Kurosaki has been able to see the spirits of the dead, but that has not stopped him from leading an ordinary life. One day, Ichigo returns home to find an intruder in his room who introduces herself as Rukia Kuchiki, a Soul Reaper tasked with helping souls pass over. Suddenly, the two are jolted from their conversation when a Hollow—an evil spirit known for consuming souls—attacks. As Ichigo makes a brash attempt to stop the Hollow, Rukia steps in and shields him from a counterattack. Injured and unable to keep fighting, Rukia suggests a risky plan—transfer half of her Soul Reaper powers to Ichigo. He accepts and, to Rukia's surprise, ends up absorbing her powers entirely, allowing him to easily dispatch the Hollow. Now a Soul Reaper himself, Ichigo must take up Rukia's duties of exterminating Hollows and protecting spirits, both living and dead. 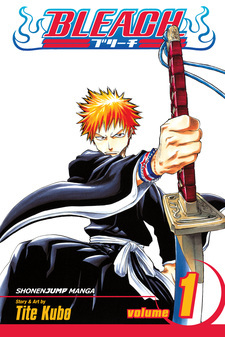 Along with his friends Orihime Inoue and Yasutora Sado—who later discover spiritual abilities of their own—Ichigo soon learns that the consequences of becoming a Soul Reaper and dealing with the world of spirits are far greater than he ever imagined. 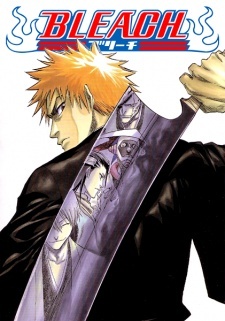 Bleach has sold over 90 million copies worldwide as of 2017, making it one of the top 20 best selling manga series of all-time; North American sales have also been significant with 1.7 million copies sold in the region. In 2005, the series won the 50th Shogakukan Manga Award in the shounen demographic category. Many adaptations have also been made of the series, with a 2004 television anime series along with four feature length films, numerous video games, spin-off light novels, databooks, and even a musical. The series has been published in English by VIZ Media under the Shonen Jump imprint since July 6, 2004 and in 3-in-1 omnibus edition since June 7, 2011; a hardcover collector's edition for volume one was released by VIZ Media on August 5, 2008, a box set of volumes 1-21 was released on September 16, 2008 as well as volumes 22-48 on July 7, 2015. It has also been published in Portuguese (Brazil) by Panini Comics and Planet Manga since July 2007, and in Spanish by Glénat/EDT since June 2006, publishing 51 volumes before the publisher went defunct, and later was republished by Panini Comics from February 2013 to November 2017. Like a flutter of a butterfly’s wing, Kubo has created the dynamic of a life after death scenario, twisting people’s minds and imaginations throughout its journey with surprises, questions, and a bold statement of what happens after we leave this world. Invisible forces play into the scenes, grasping a hold of reality and raining out a massive event that not even humans can comprehend. Sparks fly as metal swords clash. Tears fall down pale cheeks. Romances bloom like a soft flower petal in the spring. People think there is nothing after life, but they are wrong. Death is only the beginning. Taking place in modern Japan and broken into five major arcs, Bleach is unique between the “Big 3” and Shounen itself. It shaped itself in the first few chapters as a typical run of the mill high school themed manga with the characters having special powers. Over that period, the scenes and chapters just repeat itself. Nothing special happens. However, things change, and it was this that made Bleach become over the top famous. The next arc is what made Bleach what it is. Surprises and twists make the plot shake. The only way to read this is to think about it being opposite day. The many characters introduced help shape this manga and create the new world it was made to be in. There are no cheats into reading this. Every word, every panel of this arc is crucial. Like the stairway to heaven to introduce what will happen in the coming chapters. Expect the unexpected or nobody will figure out what will happen. Pay attention to detail closely in the words spoken, the plot can be easily lost. Easter eggs are a bonus and can lead to mysteries in future chapters. Now onto the serious bit. Bleach’s plot isn’t the best plot out there. It’s filled with plot holes and unanswered questions that probably will never get answered. The way it was shaped was anti-climactic and it was very, very unorganized. Seriously, pay attention. I found myself getting lost during the mess of the arcs following after the Soul Society. Although it was suspenseful and I found myself excited about what would happen next, I would often find myself disappointed in the result. The symbolism used, like the Hell Butterfly, weren’t explained as fully as I wanted it to be. Chapters also became a repetitive thing. Unnecessary events slowed the pace exponentially. And when something awesome happened, the pace moved quickly, almost as if someone was embarrassed about a performance and needed to get off the stage. One thing Bleach was very famous for was the artwork. Between the first chapter and the last, the improvements of the drawings were incredible. It was surprising how far Kubo has gone since starting out in this manga. The art is what I would like to call adorable, but not too over the top with the crazy, stereotypical eyes or Japanese character design. The character’s designs seem to make their own form of uniqueness never seen before. Kubo had made it his own and has even inspired many new artists around the world. The detail placed into the characters and the way he brought the fight scenes to life is what saved this manga into going into the trash bin at the beginning. With each panel drawn, there is always a story in them. Some panels are left blank or black to create the atmosphere and effect of the scene drawn ahead. Some are simple and build to what is happening in the chapter. Then there are those with great intense detail and quite strange designs that make the reader question what is happening in the Kubo’s mind during the process of drawing it. Plus, the colour pages that sometimes appear, come out simple with pastel-like colours placed into the page, making the tone of the chapter pop more. Take a moment and just admire the work placed into these pages. It’s something totally rare to find. Three words: Too many characters! First, long-running manga, I get it. But there is a limit to how many should be placed into a story. One rule is that characters that have a role in the story should have a backstory on how they got there. They need a purpose and need to be figured out once it ends. One problem with Bleach is that Kubo created these characters without realizing what he would have to do near the end. Many of these characters don’t seem to have a proper fight scene and when they do, it’s either very rushed or off-screened. Plus, many don’t get a backstory and are left under the rubble. Literally. Don’t be surprised if you wonder where someone is for over one hundred chapters. Chances are they are either lying unconscious somewhere or dead. Remember though, Kubo doesn’t forget characters even though it seems that he does. Second, not enough character deaths. Oh my word, yes, I said it. I wish there were more deaths than there were. Even though I am deeply upset about the loss of my favourite fictional character, Ukitake-taicho, it made sense for his passing. It made the plot move on. There are characters that were supposed to die, ie. Byakuya, that didn’t end up happen due to popularity issues. No! There needs to be a balance. If a character doesn’t die when they’re supposed to, their role in the rest of the plot becomes useless and also can change the original plot drastically. Lastly, the main cast wasn’t very good. Yup, I said it too, I disliked the main characters. Why? They were useless, over-powered, and plain annoying. Rukia seemed to be the only one I was content with, but the other’s…honestly, I could really do without Orihime and Chad. They were a waste of time. Orihime’s powers weren’t explained and she landed in the typical damsel in destress, and Chad’s were just not over-powered enough to keep up with the other characters. And Ichigo and Ishida…I got strange Naruto vibes from those two. There needed to be a development in these characters and there wasn’t enough of it. There are things out there that take me awhile to give my opinion. A dark moment in a life where light just doesn’t shine even after a bottle of wine been finished. After Bleach ended, I really didn’t know what to do. I was like a child after all their Halloween candy was gone. I couldn’t grasp the reality that after fifteen years, this huge manga was over. I was waiting, as if some being would come down and say “HAPPY APRIL FOOLS IN AUGUST!” or something. But no. Even after all of this, I did enjoy Bleach exponentially and it is considered one of my most favourite enjoyed manga, but I needed more. It was a buzz I got every Thursday morning when I woke up. I would freak out in my room whenever something major occurred. But now…that morning will be empty and will be filled with memories of what it used to. Just kidding…I’ve got other things to read now. But all seriousness, this manga was one of the firsts I picked up and will always be special in my heart. Bleach is an epic journey. Filled with action, suspense and several possible romances, it a roller coaster ride of emotions and amazing fights. Nothing compares to this manga. I give this manga 50% on the soul cleansing scale. Bleach started out as a very promising character-driven manga with several great arcs. It’s a massive shame it didn’t keep up. The story starts with a bang, builds and builds, wraps up the first few arcs in a satisfying manner and then trips over itself, rolls down a hill, into the ocean and sinks into the abyss. I can say I was thoroughly disappointed with the way it ended after the potential it showed at first. I've been reading this manga since I was 13. The story was never really anything special, but it was fun. Initially, the characters were interesting and dynamic, they felt important and the threats felt like something they needed to overcome, to grow and to protect each other and their family. I loved seeing the way everything was depicted - supernatural or not - and the absolute creativity of some of the designs hypnotized me. The plot, simple at first, evolves and escalates, jumping through several arcs and then begins to degrade after a specific point rather rapidly. More characters ended up introduced than it felt was needed, and often there was so much focus on the new characters that there was no room for anyone else. Ichigo (our main character) in particular was a black hole for focus, and the side characters may as well have not existed. Their motivations were paper thin, felt reused or just plain didn’t go anywhere. After a while it felt like I'd seen the same characters come along several times and not really add anything, and just questioned why they were even included in the story. Boring, throwaway villains, silly misunderstandings, pointless trips, unclear motivations. The last arc has been particularly shameless with making the final big bad just… the worst the manga has ever seen even amongst the minor henchmen. He had little to no personality, nothing relatable, charming or fascinating about him and more or less just felt like a silly plot device to try to prove how strong Ichigo was and /try/ to reinforce that he has an amazing relationship with the people he's met on his journey. Sadly, the message of friendship and being together as humans is undermined constantly and almost the entirety of the manga makes it a pointless aesop. Ichigo is impossibly strong and unfailingly virtuous, with just enough flaws to add a bit of depth to his character, but he is the main character who rises so far above his friends that he doesn't ever truly seem to connect with them. His friends who began as interesting become quickly underpowered compared to him and to the enemies he faces. Having a character who is miles above the rest in terms of power can be pulled off successfully, provided that he shares a deep enough emotional connection with at least some of the cast and that doesn’t lower the stakes of the story. Unfortunately, Bleach does not succeed in this and most of the initial friends Ichigo made get the same treatment as much of the side characters from Dragon Ball Z, becoming completely unable to compete on any level, or even keep up, with our main character. It was a true shame to once again have a shounen series fall victim to this. It left a terrible aftertaste. For anyone willing to read things before the downfall, up to chapter 182 was a great exciting adventure with plenty of characters to enjoy (but not too many), and a fairly well balanced character driven story. Or up to chapter 423 where it was still...complicated and interesting but beginning to feel a little bit samey. For those willing to continue reading past that point, I would advise that you prepare yourselves for disappointment. I don't know what Kubo was thinking with the majority of the later plot, but much of it felt flat or just plain not impactful. A common and well-deserved complaint was how cheap many of the plot devices were and how little things seemed to actually matter in the long run. Another complaint was the over build up for many a lacklustre reveal. As for the art - it was clean and fairly well executed. Later on a lot of the scenes become hard to follow, with too many effects and cluttered panels, but the character designs and environments were overall of an acceptable level. You could however argue that, barring a few, Kubo falls into same face syndrome much like many manga authors, reusing the same general faces for specific types of characters with marginal alterations. It wasn’t the most amazing art ever but it was definitely above average. In summary, Bleach started its run as a pleasant experience with more ambition than it knew what to do with, and it eventually caved in under the weight of its enormous but underdeveloped cast, disproportionate focus on a single character whose importance was poorly justified with increasingly contrived plot twists, and an overabundance of questionable creative decisions. Sorry if this is kind of all over the place, it's my first review and I wanted people to know this manga started well, but still ended terribly. I mostly want to save anyone else from reading the next 200-300 chapters because it isn't worth it. The ending has offically came. After 15 years of publication which experienced a some big highs and many lows, the long winding series of Bleach has reached its conclusion. Now before I get into the highs and lows of this series I will say its quite a mixed reaction in terms of its ending (without spoilers) because on one hand I was glad that a manga that has suffered more than it needs to at least got some form of conclusion albeit rushed and on the other it is really sad to see a series thats definitely helped bring people into the world of manga end in such a quick way without warning despite its success before things took a bit of a turn for the worst. First off , the rating I have given the series overall isn't a true reflection of my opinion on Bleach. I personally think its very hard to rate the series because of the up and downs its experienced so I have given it that overall based on my enjoyment due to the fact it got me into reading manga as a whole. I think despite how much the series has fallen off, something Kubo always did successfully well regardless of what you think of his choices in story plot points and the fact things got dragged out, was create and draw the manga well. Bleach's art certainly deserves to be commended. Bleach is a very long running manga so many characters are introduced and many touched upon so I am only going to cover a few of the mains and my favourite characters. First off is Ichigo the main character who for the most part is a really good main character, he has similarities to Goku and Naruto but isn't as a complete blockhead as them as he is shown to be pretty good on tests for example. He carries the show pretty well for the most part. Rukia Kuchiki is the character that gives Ichigo his powers by mistake and is portrayed as a generally calm character who acts almost like ichigo's guide in how to be a soul reaper and also happens to be the soul reaper he has the most contact with. Other main characters include people not related to having Soul Society powers such as Chad who eventually gets almost but on the back burner, Orhime who is the healer of Ichigos friends an over the course of the series falls in love with him and Uryū the calm smart one of the group who always attempts to act cool. There are many other characters i could talk about but my favourites have to be Kenpachi, a brute force Soul Reaper who has a very terrifying demeanour for some and Shinji Hirako a somewhat comical Soul Reaper introduced a bit later than most others. To start off with Bleach I think its a good manga in the beginning; it had a lot of potential and was doing a good job in my opinion in the beginning. I started watching it first I believe on Toonami back when it was late and on adult swim, so wanted to get into the manga. In my opinion if it had ended possibly after the Hueco Mundo arc it possibly could have ended on a better note. From the beginning till the end of Hueco Mundo arc everything in a sense kind of lines up together and although the art work was a bit unorganized in a sense the story still felt great an original. There is a scene when reading where the protagonist grows through in a sense a power up and it's appalling to see that it was kind of stolen from another manga. The originality of it steadily decreased as time went on. They could have stopped it at certain point which would have left it in a bitter sweet moment, but the push to keep having it go just made it feel dragged. The worst part in my opinion was the ending. It just didn't flow right. I'm sorry if I sound like a pessimist with this review but I felt as a reader I deserved something better especially when the other arcs were fantastic. Had they ended it were it felt perfect to end possibly this review would be praising it.